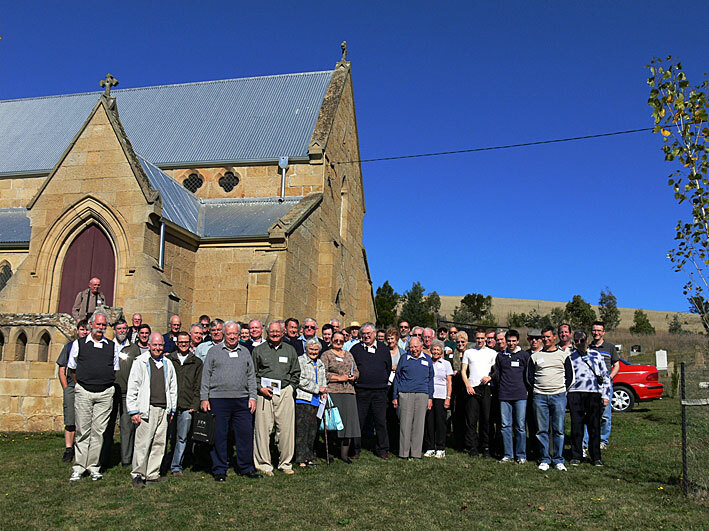 (immediately after Easter 2011 and Anzac Day) and concluded in Launceston on Sunday 1 May. places and buildings of scenic or architectural interest. Bishop F.R. 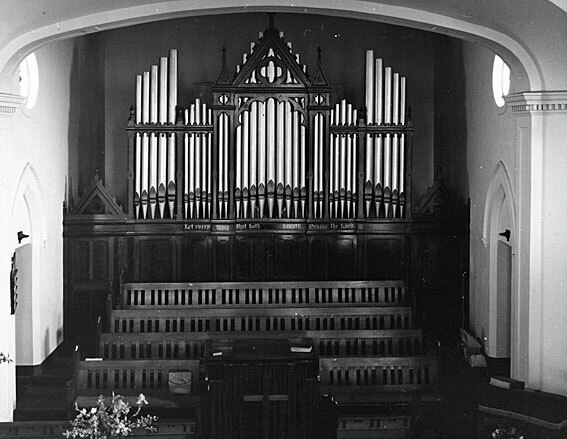 Nixon who had two pipe organs installed there in the mid-19th century. 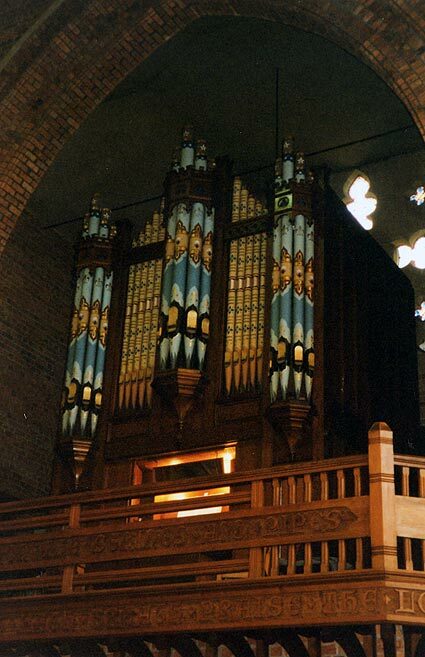 First organ, rem. to New Town, Sacred Heart Catholic Church. inst. 1895 present loc. 3m., 27 sp.st., 9c., tub.pn. Reb. 1934 Hill, Norman & Beard (o/n T23). Reb. 1957 K.R. Davis; reb. 1966 Geo. Fincham & Sons. 3m., 31 sp.st., 14c., el.pn. Gt: 8.8.8.4.4.2-2/3.2.III.8. Sw: 16.8.8.8.8.4.2.8.8. Ch: 8.8.8.4.2.8. Ped: 16.16.8.8.8.5- 1/3.4. Reb. 1986 S.J. Laurie. 3m., 45 sp.st., 8c., el.pn. Gt: 16.8.8.8.4.4.2-2/3.2.1-3/5.III.II.8. Sw: 8.8.8.8.4.2.IV.16.8.8.4. Ch: 8.8.4.4.2-2/3.2.1-3/5.II.8.4. 8. Ped: 32.16.16.8.8.8.4.4.II.16.8. B. 1870 J.W. Walker, London (job no. 905). 3m., 30 sp.st., 5c., tr. Gt: 16.8.8.8.4.4.2-2/3.2.III.8.4. Sw: 16.8.8.4.2.II.V.8.8. Ch: 8.8.8.4.2.8. Ped: 16.16.8.16. Reb. & enl. 1929 Geo. Fincham & Sons. Reb. & enl. 1966-67 J.W. Walker & Sons, Ruislip, Middlesex. 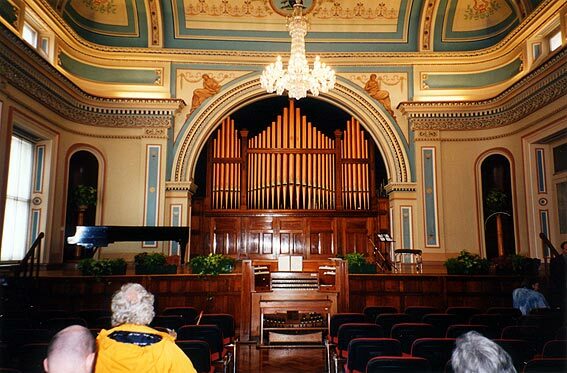 Organs outside Hobart. 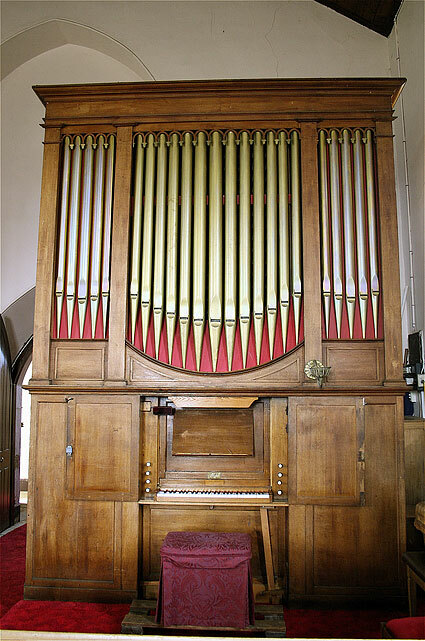 Visit to the first church organ exported to Australia at St Matthew's Church, Rokeby. Visit to the Pugin-designed church of St Patrick, Colebrook, with its triple-arch bellcote recently restored. 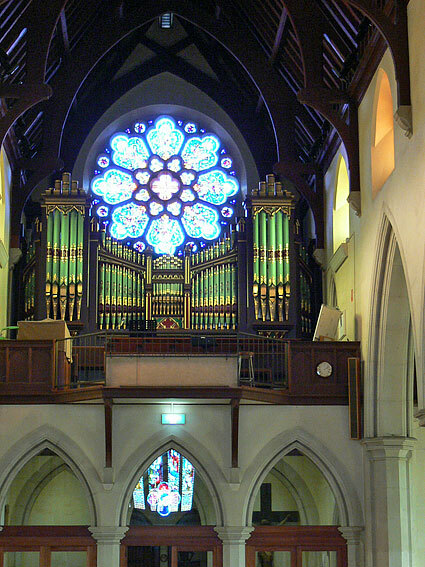 organ at St John's Church, New Town. 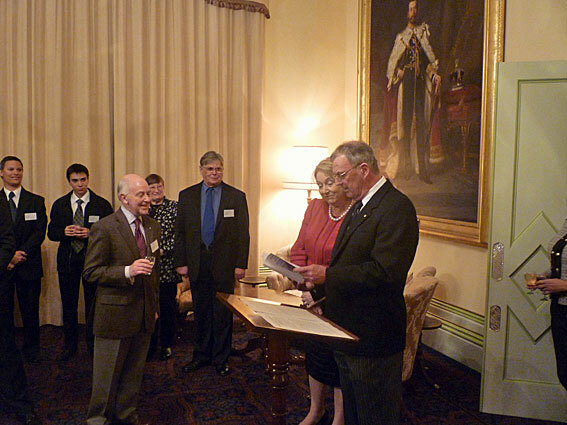 Evening reception for participants at Government House. B. 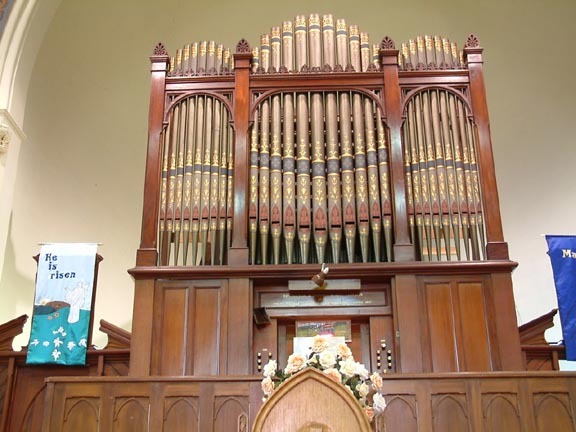 1868 Bevington & Sons, London, for Price Memorial Chapel, Tamar Street, Launceston. Inst. 1906 St John's Anglican Church, Devonport. Reb. 1966 K.R. Davis & Son (new case and swell box). Inst. present loc. 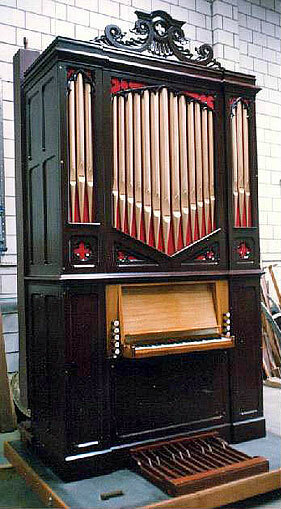 1984 Australian Pipe Organs. 1manual, 5 speaking stops, 1coupler, tracker action. Man: 8.8 divided.8.4. Ped: 16. 2/3.2.1-3/5.III. Sw: 8.8.8.4.2.III.8.8. Ped: 16.16.16.8.8.5-1/3.4.16. and lunch in the historic town. In the afternoon visits to organs by J.W. Walker and Bishop & Son. B. Bevington & Sons, London; inst. present loc. 1888. Res. 1958 R. Greaves for J.W. Walker & Sons. inst. present loc. 1891. Res. 1967 K.R. Davis & Son. 1m., 9 sp.st., pedal pulldowns, tr. Man: 8.8 divided.8.8.4.4.2. Ped: 16.8. 2 manual, 12 speaking stops, 3 couplers, mechanical action. and a meeting of OHTA members. Methodist Church, Paterson Street, Launceston. Reb. 1920 Geo. Fincham & Sons. 2m., 21 sp.st., 3c., tub.pn. Gt: 8.8.8.8.4.4.2-2/3.2. Sw: 16.8.8.8.8.4.II.8.8.8. Ped: 16.16.8. Reb. c.1975 K.R. 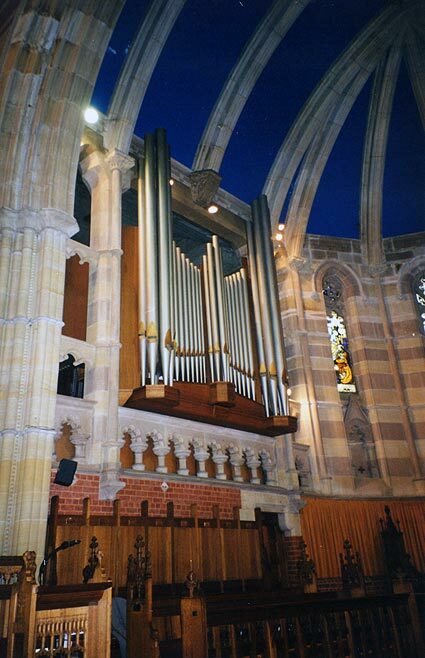 Davis & Son; completed Australian Pipe Organs. 2m., 25 sp.st., 7c., el.pn. Gt: 8.8.8.8.4.4.2-2/3.2. Sw: 16.8.8.8.8.4.2.II.8.8. Ped: 16.16.8.8.5-1/3.4.4.2. B. 1874 Bevington & Sons, Soho, London. Res. 1982 S.J. Laurie. 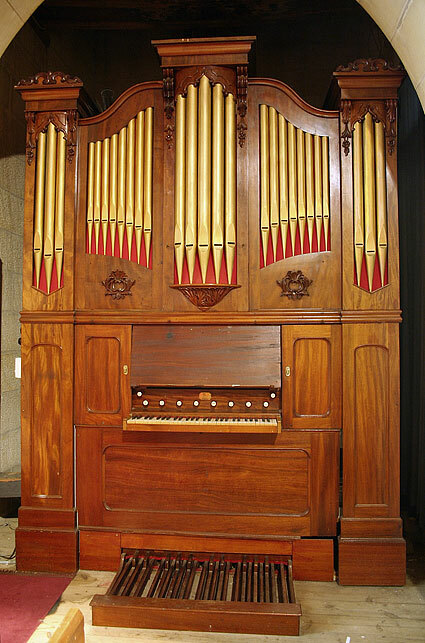 Present organ, B. 1911-12 J.E. Dodd. Reb. 1954 Geo. Fincham & Sons. 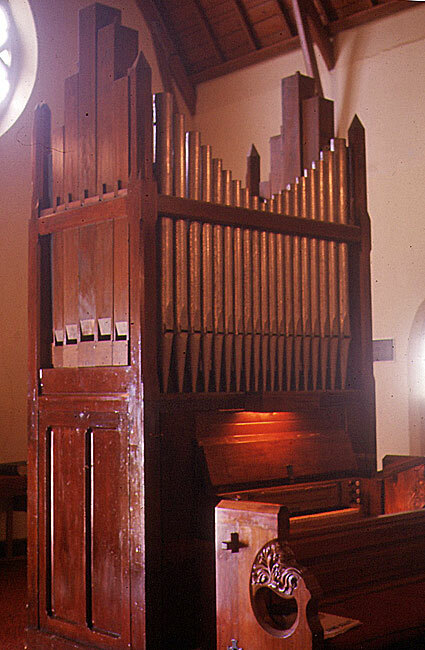 First organ, B. 1854 James Eagles, London. 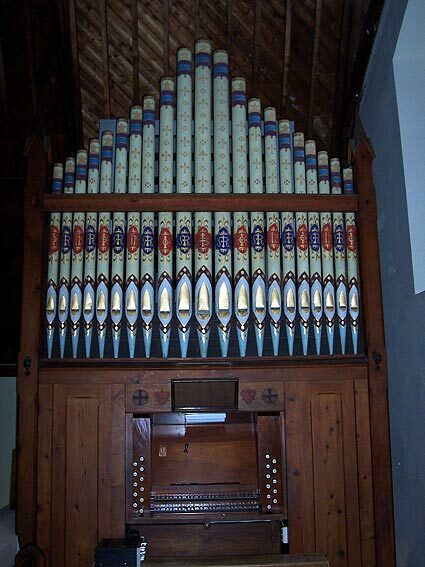 Present organ, B. 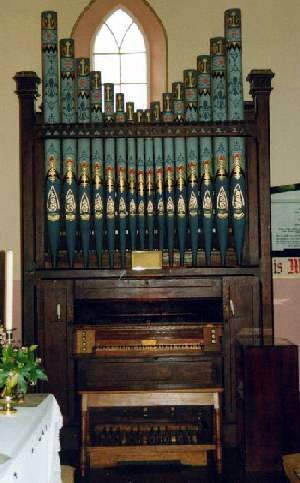 1887 George Fincham, incorporating pipework from first organ. Inst. present church 1902. Res. 1959 Davis & Laurie; new pedal action 1991 Hans Meijer. 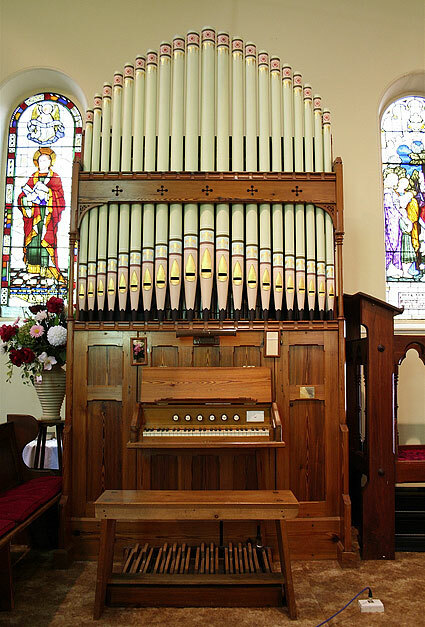 First organ: removed 1862, now in St John's Anglican Church, Franklin. 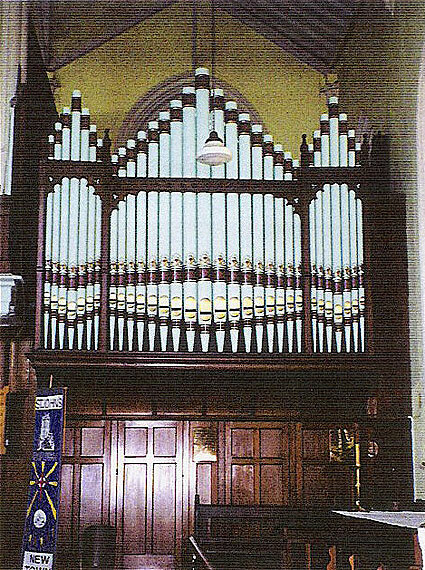 Present organ, B. 1862 Charles Brindley, Sheffield. 2m., 18 sp.st., 2c., tr. Inst. present loc. in church 1911 J.E. Dodd. Reb. & enl. 1912-c.1929 G.F. Hopkins. Reb. 1934 Geo. Fincham & Sons (detached console, new action and pipefronts). Reb. & enl. 1960 J.W. Walker & Sons, Ruislip, Middlesex. Tonal altns. 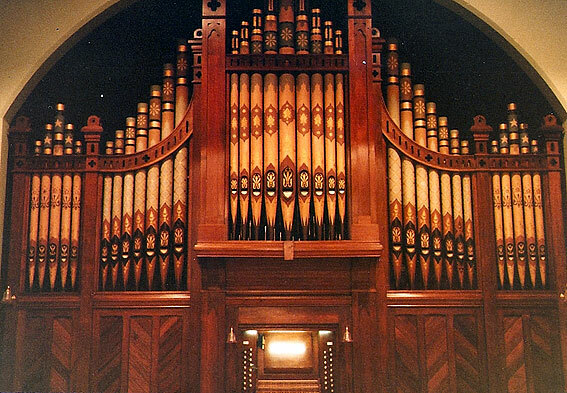 1974 Laurie Pipe Organ (32ft reed, Tuba placed en chamade). 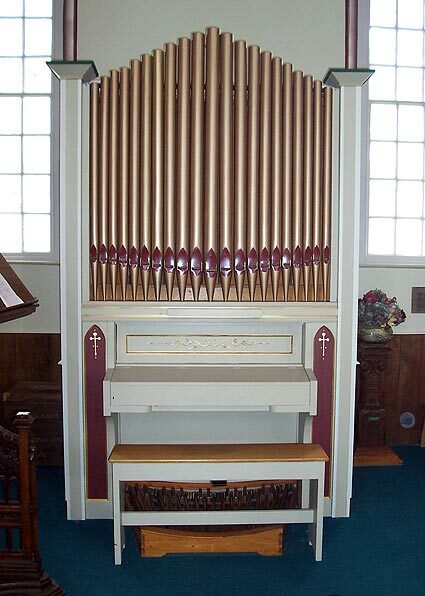 William Anderson at Holy Trinity, Westbury and a new Meijer instrument in Legana. 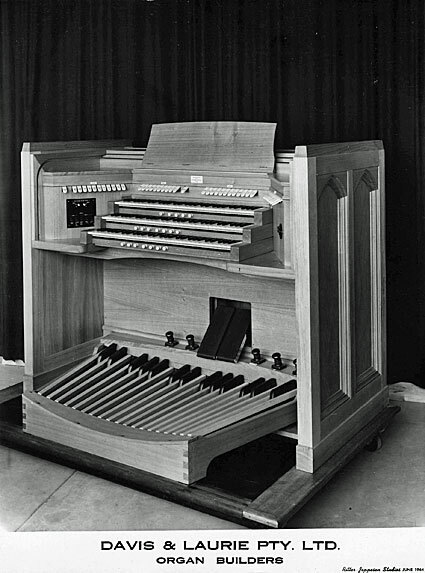 First organ, B. 1954 Whitehouse Bros., Red Hill, Qld. 2m., 8 sp.st., 7c., tub.pn. Gt: 8.8.8. Sw: 8.8.4.8. Ped: 16. 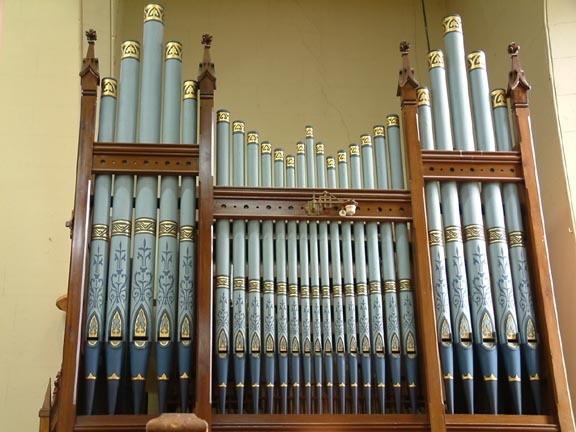 Present organ, B. 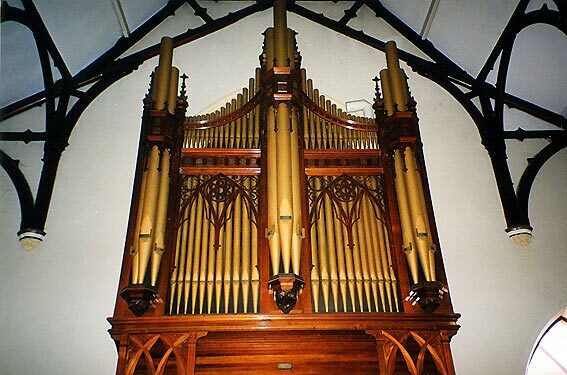 1960 Davis & Laurie (incorporating pipework from first organ). 3m., 39 sp.st. (9 rks.ext. ), 7c., el.pn. B. 1860 J.W. Walker, London (job no. 650).-- Res. 1967 Arthur Jones. B. c.1880 William Anderson; opened February 1881. B. 2009-10 Hans Meijer. 1m., 8 sp.st., 1c., tr. Second manual prepared for. Man: 8.8.4.2-2/3.2.II-III.8. Ped: 16.
airport for return flights to the mainland. 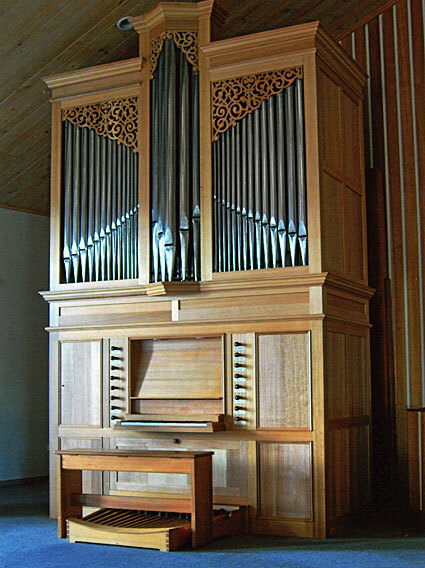 and the only organ in Australia blown by a hydraulic engine.